SY: What is your approach to staging Watermill? LV: The project positions Robbins' Watermill in a different cultural context, and by re-envisioning it for a radically different theatrical space, aims at engendering a new perception of it. Watermill is a theater piece that is enacted by dancers, or to paraphrase Antonin Artaud in his seminal essay about Balinese theater, it is a kind of superior play in which the actors are, above all, dancers. It is a radical exploration of the notion of time, and of how time is intrinsically connected to space in a theatrical event. Not of course objective measurable time, but one in which night and day coexist and where it snows in summer. A place where an entire moon cycle unfolds in one hour, while an instant seems to last for half that duration, and where of course all of it somehow makes total sense. The piece balances the apparent simplicity of its choreographic structure with the complex web of relations that governs it. As much as it lives in the opposition between the maturity and weight of its lead character and a cast of very young dancers around him. SY: What will be different from Jerome Robbins’ original? LV: I'm staging Watermill in a semi-central configuration with the audience on three sides, including on the balcony which also harbors the musicians. The characteristics of the Fisher as well as its physical properties have in fact determined the shape and form of this new vision, which is also achieved through a new lighting dramaturgy and design. The ritualistic nature of the work is enhanced by the great proximity of the audience surrounding the playing area, by seeing and sensing each other as well as the piece they will be, to some extent, part of it. The entire cast of dancers is present in the space from beginning to end, stepping in and out of a playing area painted on the floor; this might naturally generate a different dramatic tension—or rather a dramatic tension of a different type—compared to the original production which, in its proscenium configuration, was perceived as tableau-like. SY: Will the set be similar? LV: The three stacks of vegetation that are the essence of the set designed by Robbins will be there; they determine the lines of force of a space that is otherwise empty. SY: What direction, or advice on approach, will you give the lead dancer? LV: The lead dancer has to project an inner world onto a physical reality which in turn determines the space he inhabits. The tension between inner and outer reality, between his explosive compressed energy and the suspended world around him, is in my view at the core of the work. He is asked for extraordinary presence and control as he has to generate an entire theatrical universe. In this sense, not unlike the main actor/dancer in Japanese Noh, the Shite, who determines the pace of the work, and through whom all the musical and choreographic parameters flow. He has to convey the importance of pauses between gestures or movement, or the total absence of any kind of gesture or movement. SY: Was the period in which he created Watermill marked by any particular emotional or professional context? HS: I would highlight three aspects for context. First, in 1966, Robbins received a National Endowment for the Arts grant to build what became known as The American Theatre Lab (ATL). He envisioned ATL as a place for experimentation and innovation across the arts. He wanted to see what would surface if singers, actors, and dancers worked together without time pressures and without the need to come up with a finished product. The work was based mostly on improvisations; for example, they would improvise on scenes from Shakespeare and Japanese tea ceremonials. This curiosity about improvisation and experimentation informed his later work on Watermill. Second, Robbins had returned to New York City Ballet in 1969, after a 10-year absence. In the 1970s alone he composed 20 ballets, among them The Goldberg Variations (1971), Watermill (1972), The Dybbuk Variations (1974), In G Major (1975), and The Four Seasons (1979). This was an intensely productive time in his professional life. Third, the early 1970s was a time of deep contemplation and reflection for him. He referred to working on Watermill as a “healing period.” He said, “What I was healing from I don’t know. It was a re-evaluation. […] I said [to Balanchine] that it’s going to be the opposite of the kind of ballets I’ve been doing so far as the dancing is concerned. It’s going to be a search into another place.” (Christine Conrad, That Broadway Man. That Ballet Man.) During this time he would spend a lot of time at his oceanfront cottage in Bridgehampton. He would take long walks on the beach, collect shells and stones, observe the colors of the sky and the life of plants. He also started writing his autobiographical notes and spent a lot of time reflecting on his life so far, his family, his upbringing, his early training as a dancer and choreographer. It seemed to be a contemplative, inward-looking, quiet time, a rebirth. SY: Any notable gleanings from Robbins’ journals about Watermill? HS: The New York Public Library for the Performing Arts houses a set of diaries that Robbins composed from 1971—84. The first volumes, written right around and during the time when Robbins was working on Watermill, in particular illustrate Robbins’ interest in the phenomena I alluded to earlier—experimentation, deep contemplation, and healing qualities of nature. His fascination with experimentation comes across in how he explored the shape and form of the journals and the space of the page. He used skinny Japanese notebooks that unfold like an accordion and have “no spine.” He wrote on both sides of the pages: you go through the first side of the pages, then start journeying back as you read the other side. He wrote in different colors—pink, yellow, green, blue, red. Sometimes the text moves diagonally, sometimes horizontally, vertically, or in coils. He deliberately left empty spaces and wrote “empty space” next to them. The diaries show his love for nature. They are richly illustrated, featuring Robbins’ watercolor drawings, sketches, collages, pressed flowers, butterfly wings, and pieces of cloth. The writings too abound in descriptions of nature, the colors, textures, and sights he sees. He described sunsets and the “clean, crisp, clear, and biting” air. 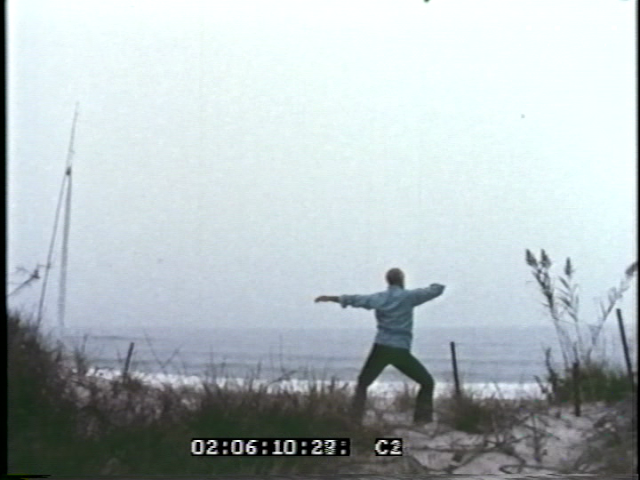 SY: Any recollections on working with Jerome Robbins as he choreographed Watermill? EV: Our relationship started when I was a kid, and when I first joined NYCB and over the years, he had done a number of interesting things for me, one of them being Watermill. he started to explain his points of departure, and what the work was about… and as you know, Watermill was an extraordinary work, very unfamiliar to the ballet world. The story’s about a man looking back at his life. He just began to choreograph and he choreographed while the score was being made, so there were these Japanese instruments and musicians. it was a fascinating circumstance, first of all to be listening to the score, which was not familiar to any of us—the style, the approach— so we all knew it was something quite extraordinary, and something we would have to bring our own imaginations to other than what he provided us with. It required my mind throughout the entire work, which was about an hour or so. ... He was constantly providing us with information and so on, so everything was fresh and new, and every day would be something new and different, and something stimulating. He was going back and forth through history also. He was almost doing it as a Noh play. We had danced in Japan, and I think he was terrifically motivated by that. SY. Does it require a certain state of mind to perform? EV: Totally, completely. Literally what I would do… so you have your back to the audience, and this overture proceeds and at a certain point, you turn around, and from that moment on, it is in your hands—never to let it go, to keep that character going, that characterization, and on and on. So a work like Watermill got my creative mind totally and completely involved, and I felt an enormous responsibility over this as I was essentially carrying an entire role, and a role as esoteric as that was. At the premiere, as the curtain was going down, you could sense a … passion and an angst at the same time from the audience. As the curtain came down, the moment it hit the stage, there were screams and yells… matched by the boos. it was just unbelievable. SY: Was the director Robert Wilson (a frequent BAM artist) influential or involved in creating/staging Watermill? EV: I would expect a great deal of exchange had gone on with those two, Jerry and he… obviously none that I was privy to, and even when he was there, I never saw him, and he was always working with the techie people, lighting and whatnot. I’m fairly sure that a great deal of that was going on, and certainly influences with the music and the choreography… that was a changing, living circumstance.